Trump Talks Jobs At Boeing Plant In South Carolina : The Two-Way The president's visit to the North Charleston plant comes after the company's employees voted against unionizing. "We want products made in America, made by American hands," he said. 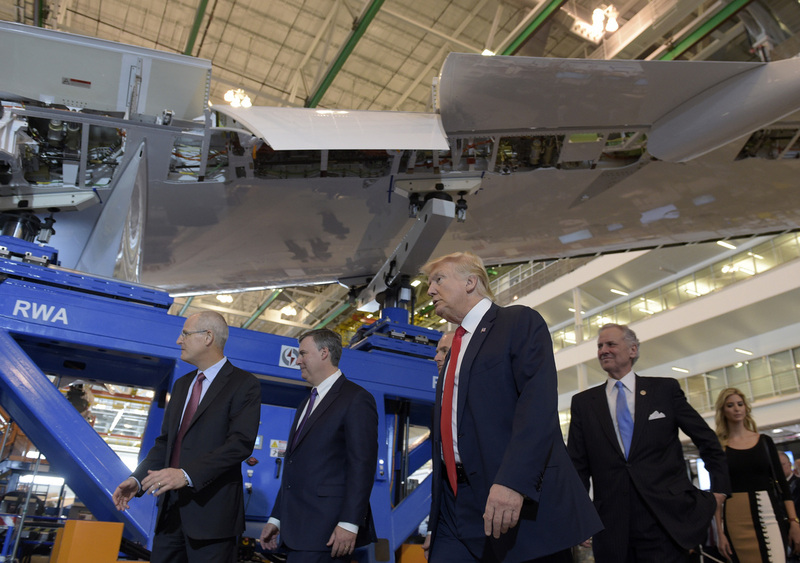 President Donald Trump tours the Boeing facility in North Charleston, S.C., with CEO Dennis Muilenburg (left) on Friday to see the 787 Dreamliner. More than two months after he publicly criticized Boeing over the costs of a new Air Force One, President Trump visited one of the aircraft company's newest facilities Friday: a plant in North Charleston, S.C., where the company will unveil a new version of its 787 Dreamliner. The president spoke nearly 24 hours after delivering a wide-ranging news conference in which he discussed, among other topics, U.S. relations with Russia; the resignation of Michael Flynn as his national security adviser; his legally contested travel ban; and a new executive action on immigration. We've updated this page with news from Friday's event. "I have to say, I love South Carolina. I love it," Trump told a large crowd Friday, saying that his campaign hadn't been expected to win the state — presumably referring to the Republican primary season — but that he had won in "a landslide." Speaking after receiving a tour of the plant, Trump headlined an event that also included both the Rev. Eric Manning of Emanuel AME Church in North Charleston and Gov. Henry McMaster, along with Boeing CEO Dennis A. Muilenburg. The event included a blessing of the Boeing fleet by the Rev. Charles Jackson of Brookland Baptist Church in Columbia. "I have to say also: That is one beautiful airplane," Trump said, gesturing toward the new airliner behind him. Promising "to unleash the power of the American spirit, and to put our great people back to work," Trump said that "we want products made in America, made by American hands." That was a theme that ran through this speech, as Trump spoke out against companies that export jobs and said it should be easier to manufacture products here in the U.S.
"My focus has been all about jobs. And jobs is one of the primary reasons I'm standing here today as your president," Trump said. "And I will never, ever disappoint you. Believe me, I will not disappoint you." Early in his speech, the president also mentioned big government projects that have involved Boeing, from the F-18 Super Hornet and Apache helicopter to Air Force One. "That plane, as beautiful as it looks, is 30 years old. Can you believe it?" Trump said, gesturing toward the tarmac where the president's current aircraft sat (Boeing's plant shares space with Charleston's airport). "What can look so beautiful at 30? An airplane," Trump said. Jokingly gesturing back and forth between the two, he added, "I don't know — which one do we like better, folks? Tell me." At one point, Trump told the crowd, "In the old days, when I made this speech, I got paid a lot of money. Now I have to do it for nothing." "Not a good deal, but that's OK, we love it," he added. Trump ended his speech by saying, "God bless Boeing." Boeing also produces the 787 at its final assembly plant in Everett, Wash.; the company says its South Carolina facility builds all three versions of the jetliner — the 787-8, 787-9, and the 787-10, which the company says is the "newest and longest member of the family." In early December, Trump threatened to cancel an order for a new Air Force One, saying that Boeing's price "is totally out of control." In January, Boeing was a corporate sponsor of Trump's inauguration, even as it was announcing buyouts and layoffs. This week, it emerged that the president allowed Boeing's CEO to listen in on calls to the general responsible for the F-35 fighter jet — which is made by Lockheed Martin. Trump's visit to Boeing's plant comes after the company's employees in South Carolina voted against unionizing at their plant, rejecting an offer to join the International Association of Machinists on Wednesday. The president visited South Carolina one day after the state's now former Rep. Mick Mulvaney was confirmed as director of the Office of Management and Budget.